Egis Körmend is the first semifinalist of this years Alpe Adria Cup. After losing game one against USK Praha, they flipped the scriped in the second. Referees: Tibor Kulcsár, Alajos Horváth, Zsolt Szalai (all HUN). Venue: Körmend Sports Hall (HUN). Scorers Egis Körmend: Price 23, Hammonds 16, Ferencz 12, Thames 9, Bradford 8, Delas 8, Csorvási 7, Németh 5, Kiss 4, Balogh 2. Scorers USK Praha: Appleby 14; Mares 12; Krivanek 8; Vukosavljevic 7; Tuma 6; Stevanovic 3; Sehnal 3. 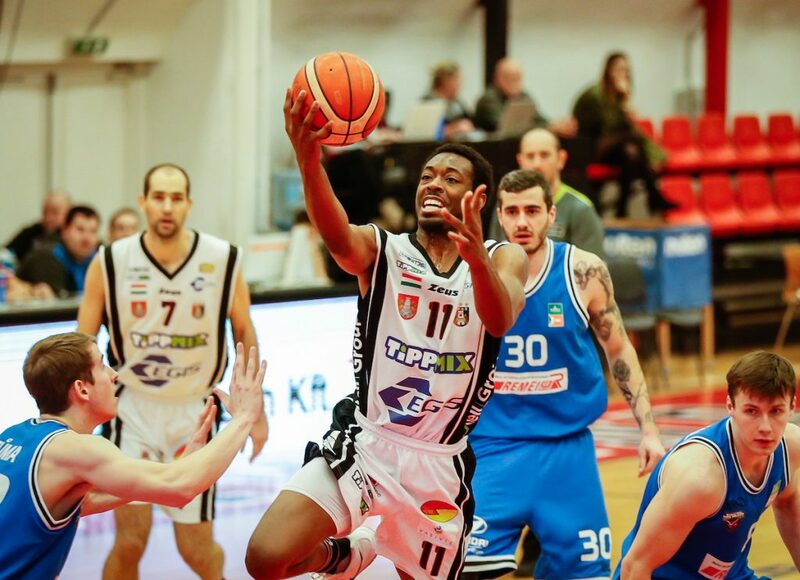 Previously when the two teams first played against each other in the quaterfinals in Prague, it was USK Praha who managed to defend homecourt and gain an advantage of 8 points. If the hosts would like to qualify for the semi-finals they have to defeat the visitors by at least 9 points during the decisive second match tonight. The game started with the visitors 3 point jump shot by Mares but soon afterwards Hammonds answered with a lay-up. At the beginning of this period a tied game could be seen. Both teams showed a very strong play throughout the whole period. The leading position changed several times, but finally it was the hosts who scored the greater number of points. The second quarter was opened with Csorvási’s free throws, which was follwed by a 9-3 point run when Körmend had their first 10-point lead with Price’s shot from behind the arc. The home team showed a more concentrated play in this quarter and continued their strong play. Although Praha tried hard to come back into game they were not able to chip away at the lead. Körmend were in the game all the way through in this period and did not let the visitors tie the game anymore. The home team went into halftime carrying an 18 point lead. After the halftime break Körmend carried on their energetic play while Praha made many mistakes and they seemed to lose their rhythm and control over the game. The whole period was controlled by the home team. In the last minute with Ferencz’s 3 point jump shot the hosts led by 30 points. This quarter ended 67:40. In the last quarter Körmend carried on dominating the game and Praha did not have any chance to catch up with the unstoppable hosts. Zollner gave an opportunity to young players to show their play on court. The hosts had the game under control and took revenge for the loss in Prague. Finally the game ended with the victory of Egis Körmend who is the first semifinalist in the Alpe Adria Cup in this season. It was a good game for T.J Price who led Egis Körmend to the semi-finals by scoring 23 points in 24 minutes on the court.